Monitoring analogue transducers including pressure, temperature, force, voltage and current. It is available from us and Windmill's data acquisition shop . Count totals, frequency, periods, pulse widths and elapsed time. Save minimum, maximum, final and averaged values over your chosen logging interval. You can set a scale and offset factor to the count from software. For example if the pulses came from a flow meter which produced one pulse for every 50 millilitres, a scale factor of 0.05 would give a reading in litres. Data can be saved in text files, xml files, Energy Lens files and to a MySQL database. The Microlink 840 costs just 295 pounds and is available on-line through Windmill Software's data acquisition shop. You can also buy direct from us - e-mail sales@microlink.co.uk or telephone +44 (0)161 834 6688. Whether bought from Windmill or ourselves we provide free technical support for life. Please get in touch if you need more information - e-mail sales@microlink.co.uk. 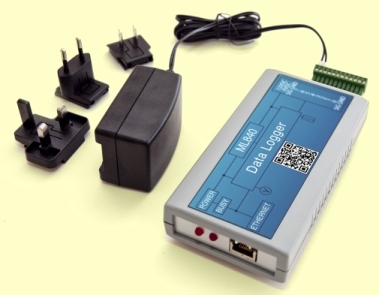 You can also download the Data Logger leaflet and 840 Data Logger User Manual. logging every hour gives a month's data storage.